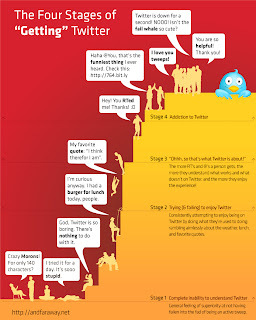 This infographic shows how you get different stages when you start using Twitter. There are four stages. The first one is about the skepticism. In the second one, the user tries to enjoy and understand Twitter. After that, the user says "Ohhh, so that's what Twitter is about!" and finally, in the four stage starts the addiction to Twitter.